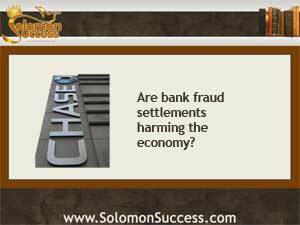 Solomon Success > Blog > Can Bank Fraud Cases Harm the Economy? Today, the seemingly never-ending string of lawsuits pressed by the US Department of justice against the country’s biggest financial institutions represents a step toward the paths of justice and equity. But some financial experts are now questioning whether the government’s relentless pursuit of these institutions could harm, rather than help, the economy. The Chase settlement joins a long list of recent outcomes to lawsuits pressed by the Justice Department and other entities against the big banks for a variety of civil and criminal charges. The case against Chase, like many of the other suits against the bank and its cohorts including Bank of America and Citigroup, involves “misrepresentations’ made to bank customers and other investors, much of which stems from the 2008 housing collapse and its aftermath of massive foreclosures and fraudulent lending practices. Consumer advocates and financial experts have welcomed the victories as a step forward in cleaning up the banking industry and holding lenders to tighter standards. The continued legal actions expose fraudulent practices on both the domestic and international fronts and demonstrate that even for these giant financial entities, illegal actions have consequences. The outcomes, they say, create a healthier and safer lending industry, with more long-term stability for borrowers. Industry watchers point out that these dire predictions have yet to manifest, and that it’s essential to establish safeguards around an industry that. when largely unregulated, was responsible for the housing industry bubble and crash in 2008 as well as a string of clearly illegal and fraudulent actions at home and abroad in the years following. They argue that to give the big banks a pass on criminal behavior places consumers at risk and encourages abuses.